Cholesteatoma is an abnormal migration or growth of skin from the ear canal into the middle ear. Generally, cholesteatomas occur in the form of a pouch or cyst that sheds old skin and other waste materials built up inside the ear. The cholesteatoma can gradually grow in size and destroy the neighboring delicate bones. Once the skin finds its way into the middle ear, it tends to collect and fill up the space between the middle ear and the mastoid (the bone behind the ear). This condition can lead to problems such as chronic infections and erosion of bony structures. Cholesteatoma usually occurs as a complication following a chronic ear infection but it can be a congenital (birth defect) condition too. The Eustachian tube is responsible for conveying air from the back of the nasal passage into the middle ear, a process that equalizes ear pressure. When the Eustachian tube does not function properly, it leads to an accumulation of negative pressure in the middle ear creating a pocket or a cyst called the cholesteatoma. Over time, this cyst fills up with old skin cells and other waste materials and gets infected. The infected sac may grow bigger and break down some of the surrounding middle ear bones or other ear structures, affecting balance, hearing ability, and even the normal functioning of facial muscles. dysfunction, may occur in the middle ear and other places, such as in the neighboring skull bones. 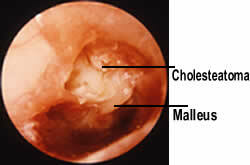 Initially, cholesteatoma may produce ear drainage, sometimes with a foul smell. When the sac or pouch enlarges, it can cause a feeling of pressure or fullness in the ear. This condition is often accompanied by hearing loss. An ache inside or behind the ear may be present, especially during the night. Dizziness and muscle weakness on the side of the face where the ear is infected may also occur. The presence of any one or all of these symptoms needs medical examination. An ear exam could show a perforation or pocket in the eardrum, commonly with drainage. The accumulation of old skin cells may be tested through a microscope or an otoscope, a special instrument for examining the ear. Sometimes, a mass of blood vessels may be present. A cholesteatoma can be difficult to diagnose because in many cases, the cyst remains invisible to the naked eye. The cholesteatoma only shows signs of its presence, such as a small opening on top of the eardrum where the mouth of the cyst has developed. Sometimes, hearing loss and repeated middle ear infections are the only signs that indicate the condition. Recurrent infections may make it difficult for the doctor to examine the insides of the ear adequately. A careful microscopic examination (generally performed under anesthesia) makes it possible to identify the presence of a cholesteatoma cyst. To rule out other possible causes of dizziness, the doctor may recommend a CT scan or an electronystagmography. If the infection and cholesteatoma are left untreated, the cyst can increase pressure accumulation and eventually lead to the erosion of pathways deep within the mastoid and skull. Should hearing loss occur due to cholesteatoma, the symptoms can be sensed at an early stage. The collection of waste materials gradually gets infected, accelerating the process of bone erosion. As there are no blood vessels supplying the cyst, the condition tends to be resistant to antibiotic treatment. Surgical removal is the most effective way to treat cholesteatoma. Initial treatment for cholesteatoma may include careful cleaning of the ear and its canals, antibiotic intake, and application of ear drops. Therapeutic procedures focus on controlling the infection, thereby stopping drainage from the ear. The growth characteristics of the cyst and the extent of infection are also evaluated. Surgery is the most common method of treating cholesteatomas. Surgical removal of the cyst prevents the patient from experiencing serious complications by eliminating infection, minimizing destruction, and thus restoring hearing abilities. The surgeon may recommend balance and hearing tests, CAT scans, and x-rays of the skull bone next to the ear. These tests are done to evaluate the level of hearing that remains in the affected ear and the extent of destruction the cyst growth has caused. In most cases, surgery is performed under general anesthesia. Tymnoplasty – surgery on the ear drum or the middle ear bones, and mastoidectomy – surgical opening of the mastoid located behind the ear, are the two common procedures involved in cholesteatoma surgery. In cases where it is not possible to remove the entire cholesteatoma in one operation, a second surgery is required. The second procedure is mostly performed six to twelve months after the first surgery. Patients are put through follow-up visits to ensure there is no re-growth of the cholesteatoma cyst. Those who have undergone a mastoidectomy surgery are advised to visit their physicians every few months to prevent the development of new infections. Prompt diagnosis and complete treatment can help prevent most cases of cholesteatoma. If not removed, cholesteatomas generally continue to grow. Surgical removal is the most successful solution for the condition. Patients may need occasional ear cleaning. If the cholesteatoma comes back, additional surgery is required. Most medical insurance providers cover the costs for cholesteatoma surgeries. However, it is always good to check with the insurer first. Because cholesteatoma is curable and generally not a long-term illness, a private medical insurance could also help. Cholesteatoma is a serious but a treatable and curable ear condition. It can be diagnosed only through medical examination. Persistent ear ache, ear pressure, ear drainage, dizziness, facial muscle weakness or hearing loss indicates the need for examination by a physician. 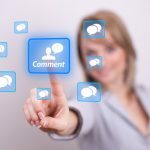 This is a guest post by Sindhu from Healthprotected.co.uk . 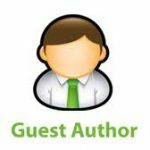 If you are also interested to write for HealthResource4u, Please check our guest posting guidelines at write for us. What do you take for the pain please?